It starts with this. US Patent No.2318295. I love to do research on my vintage finds, but when I discovered the US Patent No. label on the inside of a recently acquired Davidow vintage wool jacket, I decided to do a little more digging. Fashions, especially in this day and age, are rarely patented. 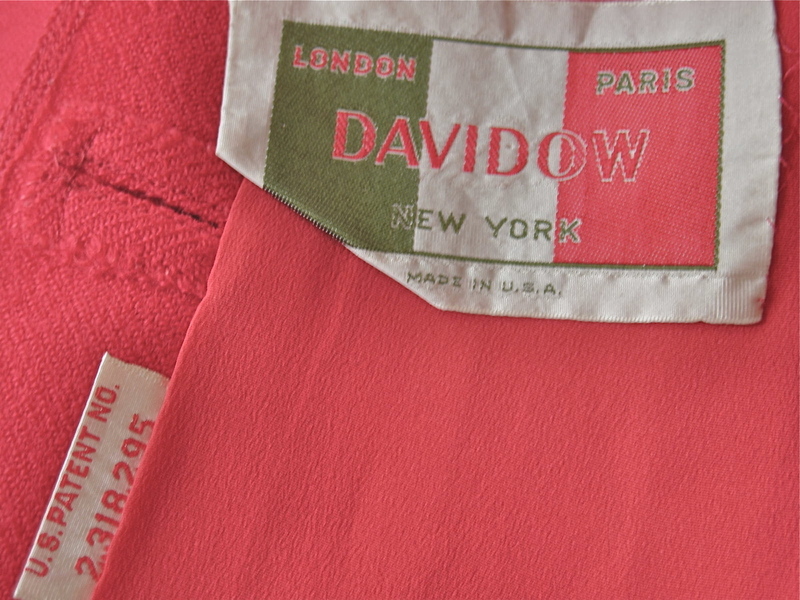 Davidow was a high end women's suit and coat designer / tailor/ manufacturer that started out as William Davidow and Sons in the late 19th century. Eventually they became Davidow and were carried on the high fashion floors of the best department stores in the nation, well known for their expert tailoring. By the 1960's they primarily focused on tweed "Chanel" styles and replicas. The jacket I have seemed to date before the 1960s and has some wonderfully interesting seam work and details. Besides the lovely chevron breast pockets, I noticed that the seam work was designed with ease in tailoring in mind. 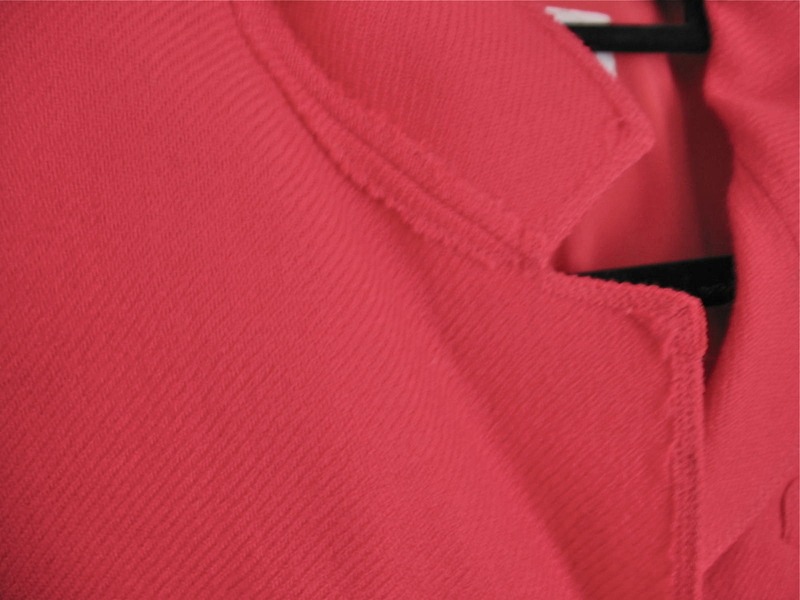 Do you see the top button hole in the seam? Having studied tailoring in design school years ago, I also noticed that his jacket doesn't have the usual facings to make up the collar or back up those bound button holes. This is interesting indeed! The patent tells us why. I was delighted when I found the patent! Melville Davidow is named the inventor of the special construction of a faceless tailored jacket. He goes into detail with drawings on how the seams of the collar and lapel will be handled, so they don't show. He also goes into detail on the bound buttonholes. The patent was filed in 1942 and issued in 1943. The patent was a way to save hard to get nice fabric and woolens during war time rations. Above are some, albeit fuzzy, shots of the details. I love discovering more about fashion history, and I find patents on apparel construction to be so interesting! Especially for the wartime effort! 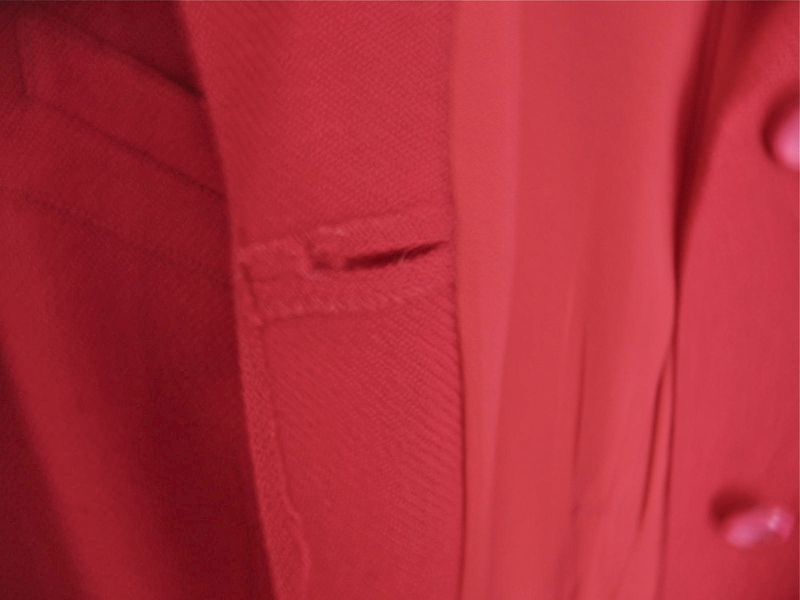 If you'd love to own a piece of tailoring history or just simply need a cool red wool jacket, this marvelous Davidow jacket is available in my shop. All photos copyright of Bobbins and Bombshells. Patent illustration from Google Patents. 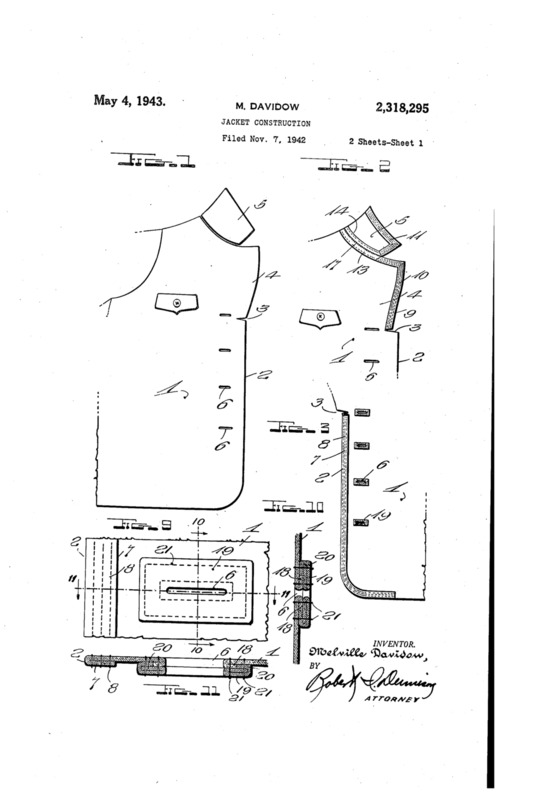 Read more about Melville Davidow's patent here.